Chelsea will have two representatives in the England side headed for the World Cup in 5 days time. 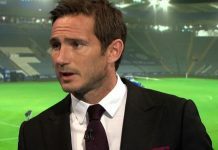 Despite recently announcing he will be leaving Chelsea upon the expiration of his contract, Frank Lampard will travel to Brazil as a Chelsea player, and will be the Three Lions vice captain during the competition. At 35 (turning 36 the day after England’s game against Uruguay), Lampard will be the eldest member of the 23 players travelling. International team-mates Phil Jones and Jack Wilshere would have been in pre-school, Raheem Sterling wouldn’t have celebrated a birthday yet and Luke Shaw could just about hold his own head up when Lamps made his professional debut in October 1995. All eyes will be on him and captain Steven Gerrard as they look to pass the torch on to the more youthful members of the team as Lampard will likely draw the curtain on his England career at the end of the tournament. Having made his debut in 1999 against Belgium, Lampard has gone on to collect 104 England caps, and scored 29 goals. He is one of only eight players to earn 100 or more caps for England, and will be looking to add more this summer. Assuming captain Steven Gerrard avoids injury between now and the opener against Italy, Lampard’s biggest competitor for that other central midfield place will be with Gerrard’s Liverpool team-mate Jordan Henderson and Arsenal’s Jack Wilshere. The other Chelsea player in the squad is one who will likely face no such competition for a starting place for England’s group games – Gary Cahill. After an impressive season with the Blues, contributing to the meanest defence in the Premier League, Cahill has been one of the few names, if not the only name, that England fans up and down the country will all agree upon when naming their starting 11. England boss Roy Hodgson looks settled and happy with his first-choice centre back partnership of Cahill and Everton’s Phil Jagielka, having played them both throughout qualifying barring injuries. They both scored in England’s recent friendly versus Peru. Given Hodgson’s usual emphasis on a solid defence, Cahill will have to reproduce the form he showed for the Blues over the season to keep the likes of Mario Balotelli, Luis Suarez and Edinson Cavani quiet as England look to emerge out of a tricky-looking group and try to win the World Cup for only the second time. England face Italy on the 14th of June, Uruguay on the 19th, and finish the group against Costa Rica on the 24th. Should England top the group, they will face the runners-up of Group C (Colombia, Greece, Ivory Coast and Japan) in the Round of 16 on Sunday 29th June – should England finish 2nd, they will face the winners on Saturday the 28th June. Previous article£75m raid for Atleti quartet, ex-Arsenal captain to follow?